Notes: * Base is those who specified deductible. 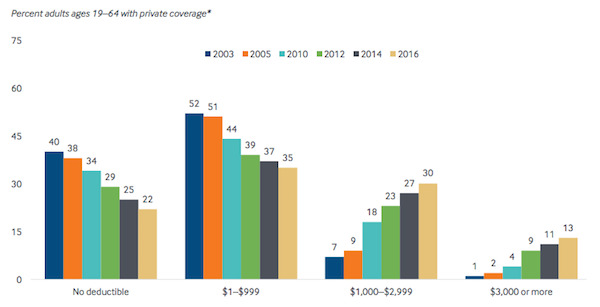 Data Source: The Commonwealth Fund Biennial Health Insurance Surveys (2003, 2005, 2010, 2012, 2014, and 2016). Source: The Commonwealth Fund: How Well Does Insurance Coverage Protect Consumers from Health Care Costs? This entry was posted in Data Watch on October 25, 2017 by Genevra Pittman.